In addition to the standard PAL series, Fabreeka regularly designs pneumatic isolators for OEM applications having custom requirements. 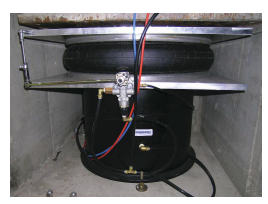 Specially designed diaphragms may be used to lower the horizontal natural frequency of an isolator to approach 1.5 Hz. Alternatively, natural frequencies as low as 0.4 Hz can be achieved using pendulums. For cleanroom applications, the exhaust air from the leveling valves is vented and the isolators are made using cleanroom compatible materials, cleaned and packaged. 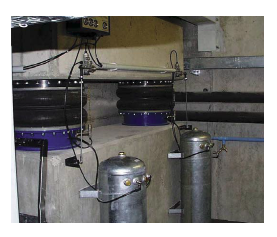 Isolators can also be made using non-magnetic materials and designed to fit in any space envelope. 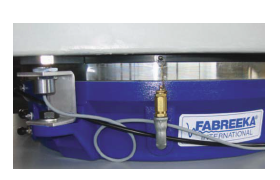 For space simulation testing in vacuum, Fabreeka can provide vacuum-compatible, pneumatic isolators. These isolators operate in low vacuum (1 x 10-7 Torr) and are manufactured with low outgassing, vacuum-compatible materials. The leak rate on these isolators is less than 1 x 10-7 cc/sec. 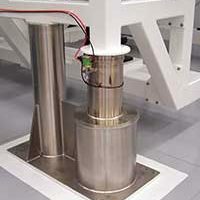 Can support payloads from 100 lbs to 40,000 lbs per isolator. Natural frequencies as low as 0.4 Hz. Custom designs to meet OEM requirements. What variables control the spring rate/stiffness of a pneumatic isolator? The spring rate/stiffness of an isolator is controlled by the area of the diaphragm in the isolator, pressure to support the weight and the volume of the pneumatic isolator. What is the shortest height a PAL-type isolator can be? The shortest height a PAL-type isolator can be is dependent on the size and weight capacity of the isolator. Isolators with small diaphragms (short stroke) can be as short as 2.5″, while larger diaphragm isolators that have a larger piston travel can be as short as approximately 4″. External volume can be used to lower the stiffness, if necessary.